Walking along 42nd Avenue, Los Pepitos Locos’ vibrant red storefront catches your eye. Peek inside and you will find head chef and owner Jose Verde fastidiously prepping and preparing generous portions of international dishes made with farm fresh ingredients featuring courses with Latin American, South American and Central American roots. The menu invites you to choose anything from burritos, tacos, short ribs, gyros and pupusas filled with savory ingredients like mushrooms or shrimp. Jose wants people to know his cuisine offers far beyond what the exterior sign says: Taqueria. Jose’s pursuit as a chef began 18 years ago when he cooked at a downtown Portland restaurant. He took the entrepreneurial leap five years ago as head chef starting the first Los Pepitos Locos on North Lombard Street. He created his own menu with a collection all of his favorite international foods. “I make something different,” Jose said, referring to the unique sauces that accompany his dishes. He suggests people try the big burrito with his special habanero sauce. In his stuffed papusas, Jose includes loroco, a vine with edible flowers native to Central America. This unique ingredient lures customers in to experience a flavor like no other. Last year the former Roses property on 42nd caught his eye as a potential space for his second restaurant. The physical layout of the building presented an ideal restaurant space, especially the kitchen adjacent to the dining area. With spring delivering comfortable outdoor dining weather, Jose was excited to open the patio, where a diner can enjoy a margarita or a fruit smoothie along with one of his international dishes. Seeing the potential of the space along with the vibrant restaurant community sprouting along the street, Jose couldn’t pass up the opportunity to land the location. 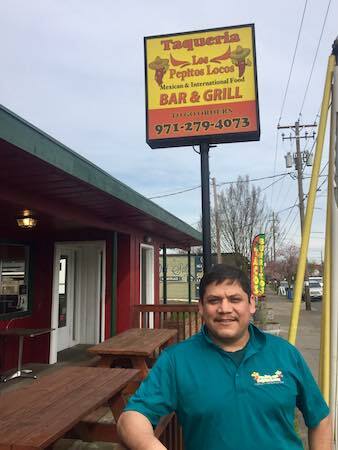 And he and his partners opened a third Los Pepitos Locos location merely weeks ago at Burnside and northeast 185th Avenue.